A symbolic study of the very first two Sea Harriers to fly with the Royal Navy Fleet Air Arm, 700 Alpha Squadron, commanded by Sharkey Ward. Seen overflying Plymouth Harbour, both of these aircraft fought in the Falklands War. 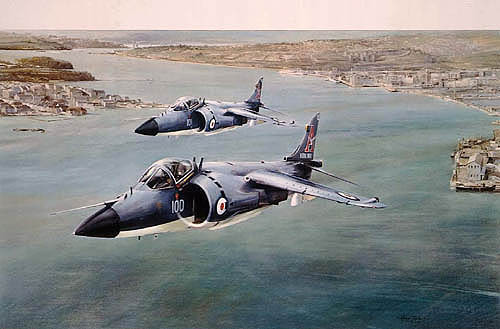 Each print is individually signed by the artist and one of the pilots of 700a Squadron RN, the first Sea Harrier Squadron.